Breaking stereotypes and record wins. "I’ve moved up a weight class and I’m definitely stronger." When you think of a boxer's diet, you probably envisage plates of steak, followed by eggs, tuna and whey protein shakes. Claire "Fury" Foreman is a professional Muay Thai fighter with a record of 16 wins and two losses. She is the current WMC state Bantamweight Champion and WMC Australian Bantamweight Champion. "I'm a Thai boxer. I got into it for self defence originally, and then I just grew to really love the sport," Foreman told The Huffington Post Australia. "I love competing, as well as the strategy, skill and hard work involved in the sport and training. I was attracted to all aspects of it." The Melbourne-based fighter trains for four hours a day, which means her diet has to keep up with it. But you won't find any animal products on her plate. It helps support the intensity of the training and I can recover better. It definitely hasn't hindered anything. I'm fitter now. "I was vegetarian for ages because of ethical reasons. When I found out about the factory farming and dairy and poultry industry practices, I was pretty horrified. I didn't want to support that anymore," Foreman said. "I found out more and more about the industry in general. For example, the land use, the effect on the environment and the treatment of cows and chickens in the dairy and poultry industry." It was at this time that Foreman started to "meet a whole lot of cool vegans" and researched vegan athletes. "I lived with a girl who was a great vegan cook. She made me coconut ice cream one day and I thought, 'I reckon I can do this vegan thing'. I was worried I wouldn't be able to eat all those good foods. "I did a lot of research about vegan athletes. It's pretty big at the moment and it's getting more popular in a lot of ultra marathon runners. I read about how these athletes are going plant-based and how it affected their training and helped their training. That was really inspiring." The decision to go fully vegan was about 18 months ago, but it was a slow process, Foreman explained. "Over about one year I started cutting out all animal products. I'd go vegan for month, then go back to vegetarianism for a month, and then I slowly replaced things in my diet," Foreman said. The first thing you might think when you hear about a vegan boxer or athlete is: well, they must be weak, right? According to Foreman, being a vegan boxer has made her anything but. "It's actually been really positive. I did not expect this, but it's helped me put on muscle in the last year. 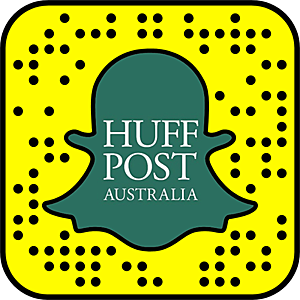 I've moved up a weight class and I'm definitely stronger," Foreman told HuffPost Australia. "It helps support the intensity of the training and I can recover better. It definitely hasn't hindered anything. I'm fitter now." In terms of the challenges, Foreman noticed that her transition to veganism has affected other people, not her own performance. "Personally, I have many supportive people around me. I feel lucky. My partner's vegan and he's also my trainer, so that helps. My strength conditioning trainer is also vegan," Foreman said. "But my friends cop a lot of flak. People also get pretty angsty when you tell someone, or you put something on social media, about veganism. They get very reactive and they can get angry at you when you're not preaching or saying anything. I'm not sure where that comes from." 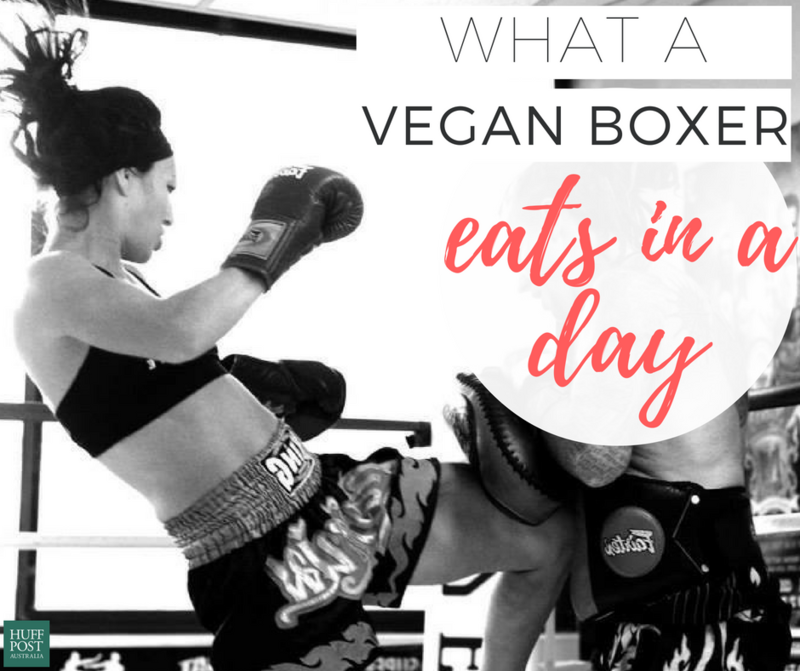 So, what does a vegan boxer eat, you ask? A lot. "I make around 90 percent of the food myself and I try to stick to whole plant-based foods, so the challenge for me is to not buy processed food as much as possible," Foreman said. "Because I eat so much -- I train a lot and I eat heaps as a vegan, as well -- it means I'm spending a lot of time prepping food, cooking and storing. It's mainly about being really organised and food prepping every week, otherwise it's a bit of a disaster." "This is a good day! I usually eat around this and this is my base," Foreman said. "I eat healthy but I'm not militant about it. I always have cheat day." "I usually drink a black coffee first thing in the morning. Then I train for an hour," Foreman said. "After training, I'll have a green smoothie with two pieces of fruit, some kale or spinach, protein powder (hemp or rice protein), and maybe some avocado or flaxseeds. Just to get all the macronutrients. That's a good recovery shake for me." Foreman's second brekkie is often a bowl of oats. Yep, second breakfast is always a good idea if you're a professional athlete. "I might have a second breakfast, it depends how hungry I am," Foreman said. 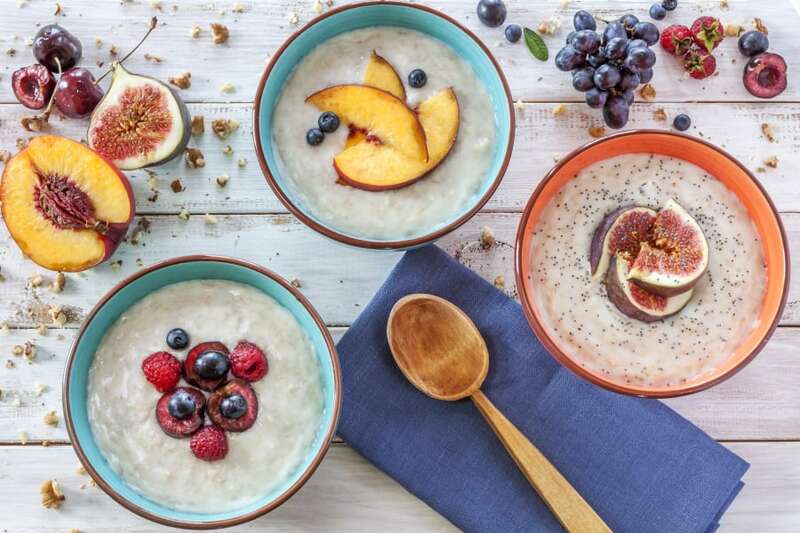 "Some oats with almond milk, seeds and berries. Otherwise, I'll usually have some almonds as a snack. I love almonds, I eat way too many." Having a balance of the three macronutrients (carbs, protein and fat) is incredibly important for athletes when eating, which is why Foreman's lunch is full of plant-based ingredients which hit those macros. "For lunch, I usually have brown rice or quinoa with beans (lentils or chickpeas), and then some salad veggies, and avocado. Then I dress it with a simple balsamic and olive oil dressing," Foreman. Before afternoon training, Foreman has a snack to sustain her for the three-hour evening at the gym. 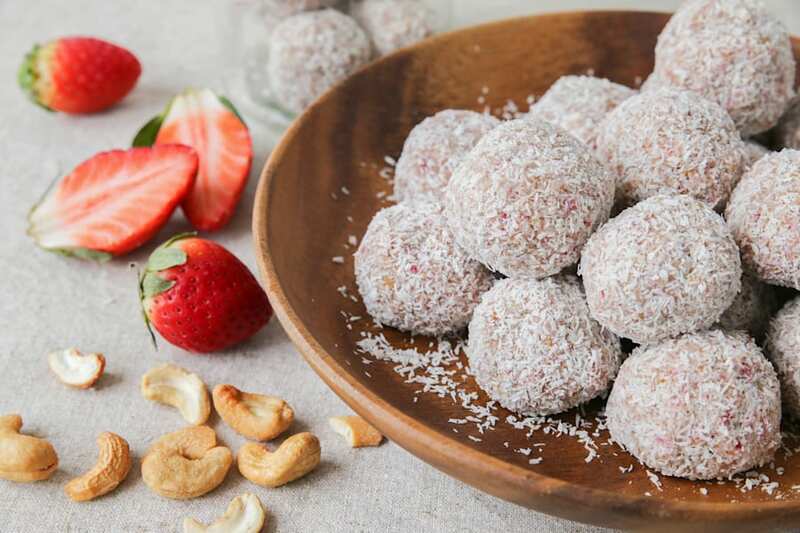 "For a snack in the afternoon, I make bliss balls with dried fruit and nuts, and with some protein powder sometimes," Foreman said. "Otherwise I'll just have some dried fruit and nuts, and maybe another piece of fresh fruit. Or I'll have some chia pudding or coconut yoghurt. "While I'm training, I'll have an electrolyte and BCAA mix. Carbs or some sugars help as the afternoon training is three hours long." As with breakfast and lunch, dinner is macronutrient balanced and is considerably large in order to support recovery and fuel the following day's training. "For dinner, I'll have a heavier hot meal usually. Satay tofu or tempeh with rice and veggies is my go-to," Foreman said. "Or I'll have chilli con carne. I always have some potato or sweet potato, and lots of greens and veggies." "Dinner is usually at 9 o'clock as I finish training at 8pm, so I don't usually have dessert. I might have some dark chocolate -- it's so typical to say. I kind of just keep snacking all evening." As for Foreman's favourite foods, like most vegans, carbs trump all. "I love a really good sourdough toast with baked beans. I also really like muffins, or just any baked goods. I love carby, starchy foods," Foreman said.